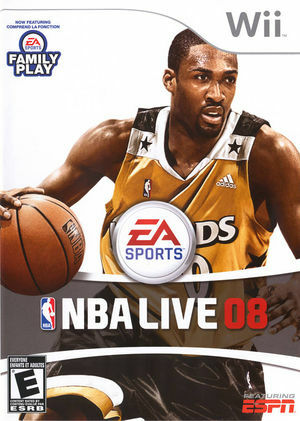 Providing an unrivaled level of authenticity, NBA Live 08 introduces hot spots, using real NBA shot data to illuminate the locations on the floor where your players are most effective. Couple this with all-new signature go-to moves that capture the essence of the NBA's best, and you can now play the game on a console like you see it from the stands. All-new shooting mechanics - from deep three-point shots well beyond the arc to 10-foot jump shots in the paint, every shot attempt has been redesigned to provide more fluid, realistic results. Dunks and lay-ups are now assigned to the same button command making highlight reel plays even easier to perform. Running at a smooth 60 frames per second, NBA LIVE 08 is as close as you can get to the court, without dropping a dime for courtside seats. Player faces, team uniforms, and authentic arenas jump to life behind the power of next-generation game graphics. Whether you're working on your game in the revamped practice gym, or playing in front of a packed house, feel what it's like to be an NBA superstar. EFB Copies to RAM + Single Core are required for arms and legs to render with the correct skin-tone. The graph below charts the compatibility with NBA Live 08 since Dolphin's 2.0 release, listing revisions only where a compatibility change occurred. This page was last edited on 16 January 2018, at 03:33.